April job additions remained positive, but registered well below the solid performance of the first couple of months of the year as many companies eased the pace of hiring. The recovery will remain choppy with significant headwinds as America’s major trading partner, Europe, faces steep unemployment challenges and what appears to be a spreading second recession. With 20 percent of U.S. exports destined for European markets, the economic troubles overseas, together with heightened oil prices, pose risks to the U.S. economy. Despite these challenges, positive forces, including strong retail sales and record corporate profits, will encourage employers to add jobs in coming months, but the gains may be sporadic. April job gains fell short of March’s upwardly revised figures, but hiring totaled 115,000 positions for the month with the private sector adding 130,000 individuals to payrolls. Professional and business services claimed approximately half of the additions with 62,000 positions, but one-third of these positions were temporary. The education and health services sector and the trade, transportation and utilities sector followed with 23,000 and 22,000 additions, respectively. The government shed 15,000 positions last month, the latest reading in a public-sector downsizing that began in May 2009 and has thus far claimed over 700,000 jobs. The reductions appear to be slowing, however, and it is likely the governmental work force will finally stabilize later this year. Wholesale and retail trade employment has expanded by 50,000 positions so far this year, largely led by retailers and restaurants. Consumer spending has risen by 1 percent this year, offering businesses sufficient positive momentum to boost staffing levels. 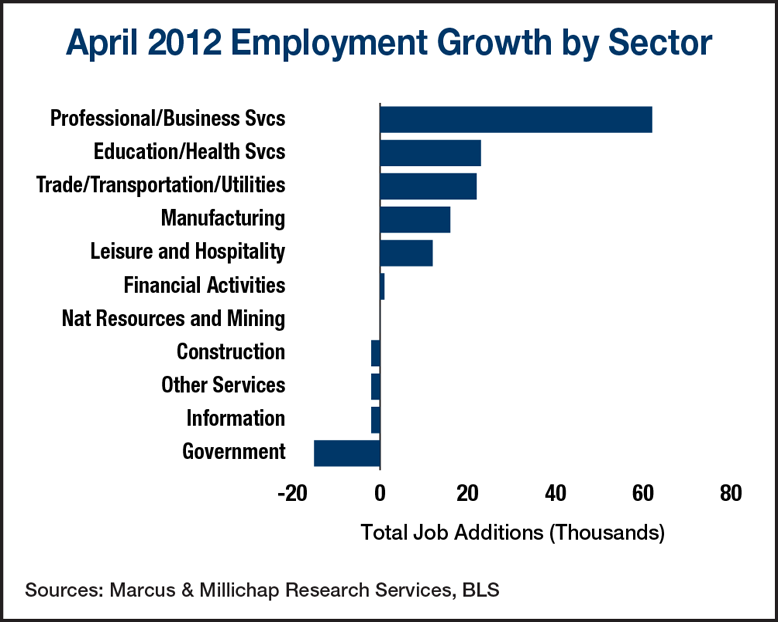 The payroll expansion of these businesses illustrate that consumers are emerging from their recession-induced self-imposed austerity. Retailers targeting the two most active market segments—luxury and discount—will continue to lead hiring trends in this arena. Though the pace of hiring eased in April, total employment has made significant headway with 1.8 million jobs added in the last 12 months. This continued positive, though moderate, employment recovery will boost discretionary income and fuel a 5.2 percent gain in retail spending through 2012. National chains, which are best positioned to expand, will ramp up openings and lead a 50-basis point drop in nationwide retail vacancy to 9.2 percent. The recession generated a structural shift in the rent-versus-own equation, with renting emerging as a favorable lifestyle alternative for many. Limited job availability, together with a frequent requirement of relocating, has inspired many to favor the flexibility of renting. This shifting attitude will support demand for apartment units through the remainder of the year, pushing vacancy down by 50 basis points to 4.4 percent by year end. This will support average effective rent gains of 4.8 percent on a year-over-year basis. This entry was written by marcusmillichap, posted on May 11, 2012 at 12:12 am, filed under Uncategorized. Bookmark the permalink. Follow any comments here with the RSS feed for this post. Post a comment or leave a trackback: Trackback URL.